LASER CUTTING SERVICES THAT HAVE BEEN PERFECTED FOR PRECISION, AND EQUIPPED FOR SPEED. 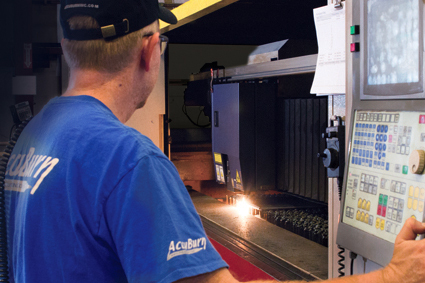 For projects with close tolerance requirements, our laser cutting services here at AccuBurn, Inc. offer a remarkably efficient means of obtaining precision cut shapes. Operating at speeds up to 800 ipm, our 3-axis, CO2 lasers provide 400-4500 W of output power to create clean, burr free cuts in materials up to .625″ thick. The flying optic configuration keeps the material stationary to allow precise control of cutting geometry over the entire 10′ x 5′ work table. Narrow, .008″ kerf combined with smart nesting software allows us to create geometrically complex forms with maximum material utilization. Special fixturing also gives us the flexibility to cut complex tubular and angle forms in a more cost effective manner than almost any other process, allowing for reduced secondary operations and precision fit of weldments and other assembled components. In addition to mild steel, stainless steel, and aluminum, we are capable of accurate and repeatable laser cutting of acrylic and PTFE components while holding ± 0.007 tolerance. FARO measurement arms, and other advanced metrology tools allow us to verify dimensional accuracy. We source only mill certified materials, and our purchasing power affords us significant cost advantages, which we in turn pass along to you. With customer satisfaction as our top priority, we pay the utmost attention to even the smallest details to ensure product quality. Our engineering team is always eager to assist or make recommendations to improve the process or product. Click on Laser Specifications button to see full process specifications. Contact us at any time for a quote on your next project.